Both Grana Padano and Parmesan are Italian cheeses that are quite famous. Both cheeses have grainy crystalline texture. However, they definitely are not identical. If you are wondering what the difference is between Grana Padano vs Parmesan, you’ve come to the right place! Below, we will discuss the essential differences that set the two apart. First of all, although they both are Italian cheeses, they are actually produced in different regions. Grana Padano is produced in a wider area, hence the production rate is higher. The production of Parmesan is more limited to certain places, so the production rate is lower. Their cows graze on different pastures and different soils, and as the effect, the cheeses have slightly different flavors. See also: Provolone vs Muenster. Grana Padano is produced in Emilia-Romagna, Piedmont, Trentino, Lombardy, and Veneto. The production rate reaches about 4,800,000 wheels per year, effectively making it Italy’s most produced cheese. It is made from cow’s milk acquired from the Po River valley. The milk for making Grana Padano has relatively looser rules. The cows for producing the milk are allowed to feed off silage, which is acquired from whole plants or cereals that are chopped and then stored in silos. Hence, some people may say that the production of Grana Padano is a little easier than Parmesan. Parmesan is actually just a nickname. The official name of the cheese is “Parmigiano-Reggiano”. According to Wikipedia, this cheese is only produced in Parma, Reggio Emilia, Bologna (the west side of the Reno river), and Mantua (the south side of the Po river). The production rate reaches about 3,400,000 wheels per year. The milk for producing Parmesan has stricter rules. The cows that produce the milk may only feed off grass or cereals that are grown in the specified area. They should not be given silage. Hence, the production is stricter and relatively more difficult than Grana Padano. The cows for Grana Padano may be milked up to twice a day. The milk should arrive at the cheesery within a day (24 hours) after the milking time. Because of this, after the milk is collected, it is usually cooled so that it can stay good and fresh for the next day’s delivery. But the temperature should not be lower than 8 degrees Celsius. On the other hand, the cows for Parmesan should be milked twice a day. The timings are consistent; one time in the morning and one time in the evening. It is very important for the milk to be delivered to the dairy within two hours after the milking time. In other words, the milk is not cooled, as the milk is immediately sent to the processing facility. Also, the temperature of the milk for making Parmesan should never drop lower than 18 degrees Celsius. This is to allow the mesophilic lactic bacteria to survive. This bacterium species is needed for the ripening of the cheese. Without the bacteria, you can’t make Parmesan. 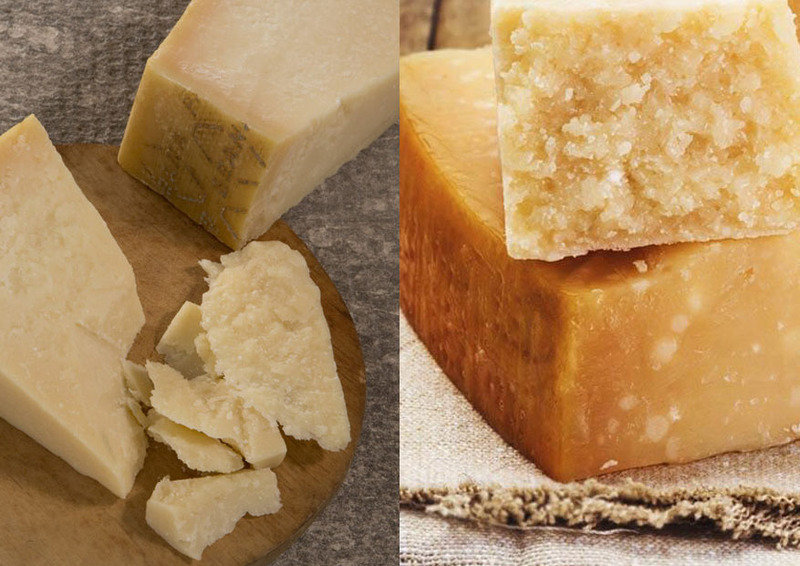 One essential difference between Grana Padano vs Parmesan is the use of preservative. Grana Padano uses a preservative, so it must be sold with a label that indicate the presence of the preservative. Parmesan should not use any preservative. Grana Padano usually uses lysozyme as the preservative. It is needed because the grass that is stored in the silos has greater risk of contamination. The lysozyme acts as an anti-fermentative agent that prevents bacterial cultures from forming in the cheese wheel during the period of aging and maturation. On the other hand, Parmesan does not use any preservative. It is forbidden to use a preservative in the making of this cheese. So, the processing facility must be hygienic to prevent contamination. 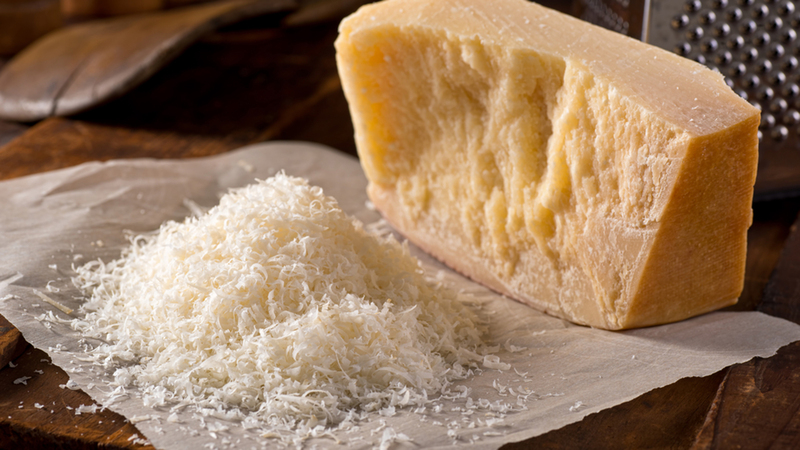 Because it doesn’t use any preservative, the produced Parmesan cheese does not need to be labeled when sold. Grana Padano is made from partially skimmed milk. As the effect, the fat content is lower. This allows the cheese to mature more quickly. 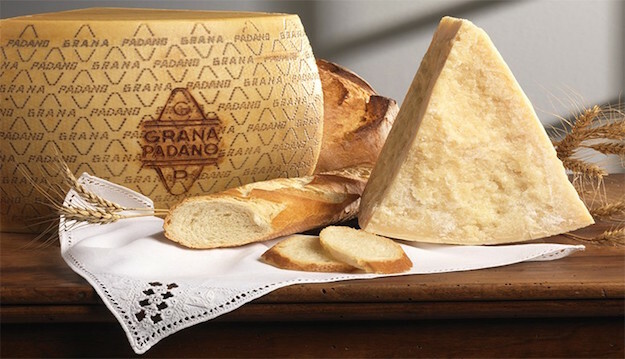 The minimum aging duration for Grana Padano is 9 months.There are three stages of maturity for Grana Padano cheese. The first stage is within 9 – 16 months, when the cheese still has a soft texture, without the graininess, and the taste is still delicate and milky. The second stage is within 16 – 20 months, in which the cheese has a somewhat grainy texture and a smell of hay and dried fruits. The third stage is within 20 – 24 months, when the cheese has a rich buttery flavor and a grainy crystalline texture. Parmesan, on the other hand, is made from a mix of whole milk and skimmed milk. The fat content is higher. Due to the higher fat content, it takes more time to age and mature. It is usually aged for 12 – 30 months. This is one reason why Parmesan tends to be more expensive. A cheese that has been aged for more than two years is called stravecchio. So, how is the flavor of Grana Padano vs Parmesan? Well, there can be variations between individual wheels of the same type of cheese. Climate and soil conditions can affect the flavor. Different seasons may also yield different cheese flavors. So, comparing these two types of cheese is not straightforward. However, Grana Padano usually comes with a softer and subtler taste. This is why Grana Padano is more commonly used for cooking. The cheese will not overpower the flavor of the food. But Grana Padano may also be eaten in chunks, and many people love the flavor. Parmesan tends to have a stronger, nuttier, and saltier flavor. You can say that the flavor is more complex. Parmesan is often eaten in chunks with prosecco, an Italian white wine. Parmesan is also often grated to top a dish. Grana Padano and Parmesan may look similar, as they both have hard, grainy texture, but they are quite different. The making of Grana Padano involves lysozyme as a preservative, and the aging process is quicker. Grana Padano has a softer, subtler flavor, so the cheese is great for cooking. Parmesan doesn’t use any preservative, and the aging process is quite longer. Parmesan has a stronger flavor. It is usually eaten in chunks and used for topping.